Three divers give the low-down on the scuba diving around Marsa Alam in the Red Sea: Dugongs, Dolphins, Sharks and Turtles by Graham Collins; Wow," I said to Anna, "I didn't expect this by Greg Kruse; Marsa Alam in the Past by Jill Studholme. Also, divers' comments on diving the seagrass meadows of Abu Dabab. Photo credits: David Collins, Greg Kruse, Suzanne Challoner, Javier Grinfeld. 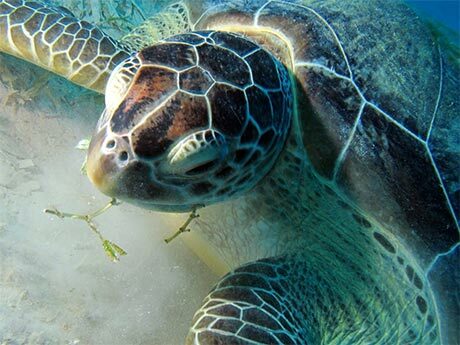 This Marsa Alam video features turtles, dolphins, sharks and stonefish. Starts with a green turtle (Chelonia mydas) eating seagrass and accompanied by a sharksuker (Echeneis naucrates). Progresses to guitar shark (Rhinobatus halavi) and trumpet fish (Fistularia commersonii). Spinner dolphins (Stenella longirostris) put in several appearances. The confusingly-named zebra shark (Stegostoma varium) shows off its spots (the juveniles have black and white stripes). Compiled from original footage by David Collins. Abu Dabab, at Marsa Alam, used to be the haunt of the dugong, but the building of 3 hotels has meant that they are now more scarce. Over fifteen years ago I stayed in a tent in the desert and dived every day up and down the coast. It was the most relaxing holiday I've ever taken. A mix of nationalities ate together each evening in the communal tent, and agreed that the Egyptian Cleopatra wine was just as bad as it had been the night before. The place was Marsa Alam and in 2004 I went back. This time I flew into the recently built airport, was whisked to my hotel and air conditioned room. We drove past my original campsite but I didn't recognise it at first as an "eco village" had been built. The coast which we'd travelled up and down in a pickup truck, and that had been nothing more than desert, had been carved into hotels and resorts. But what about the diving? Marsa Alam is very close to Elphinstone Reef. This is a fantastic dive site, featuring deep pinnacles and a very deep archway concealing a sarcophagus-shaped rock. There is always the possibility of seeing sharks, dolphins and turtles. It has steep walls and shelving plateaus, including one at around 5 m so plenty to see at the end of the dive. If you are staying at Marsa Alam you take a day boat out and do 3 dives on Elphinstone. However, you may have a 30 m depth limit, which on this dive I consider a serious limitation. With Emperor Divers' day boat, the two first dives are very close together (1 hour surface interval). You've barely time to warm up after the first dive when it's time to start kitting up for the second. Also, the day boats wallow in the waves so the two hour journey means some people get sea-sick. The other dive sites are closer inshore. They are generally pretty, with good vis and swim-throughs. 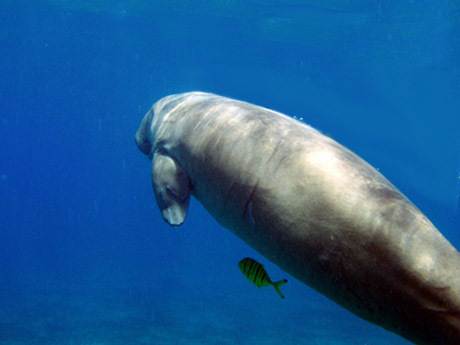 Especially interesting is the nearbye Abu Dabab where you might by lucky enough to see dugongs. If you would like a hotel-based holiday with uncrowded dive sites, Marsa Alam is the place for you. If you want to take your time diving some of the best sites in the Red Sea, then you would be better off taking a liveaboard. One which visited the Brothers, Elphinstone and Daedalus would be a good choice. For Elphinstone see Elphinstone Dive Sites. Abu Dabab is famous for its sea grass beds - home to green turtles and guitar sharks. You might also see Dugongs there. "In one of the Red Sea safaris we stopped in a small bay near Wadi Abu Dabbab, north of Marsa Alam. The bay was quite ugly as a dive site per se- a relatively small sandy patch maybe 100x100 meters devoid of coral reefs or almost anything, covered with sea grass and lots of junk. Because the charm of this sandy bay is the green turtle population that reside there, living in company of some pretty honeycomb sting rays (and rumours have it there are dugongs living there too, but can't confirm). So, into the water we went, and not more than few minutes into the dive see a huge rock covered with large remoras. Then the rock majestically starts moving, looks at us and goes on its business of munching grass. By Neptune, these turtles are big! I can't estimate how many turtles reside there, we met something like a half a dozen different ones. A pity they are endangered..."
"Abu Dabab, at Marsa Alam, used to be the haunt of the dugong, but the building of 3 hotels has meant the bay is now too busy. Also the sea grass area has been badly damaged by the washing of sand into the bay following a rainstorm: the sea grass has been replaced by a brown algal growth on the sand. Our first dive here followed the north side of the bay along the reef. This is an interesting dive and we saw 4 large remora on their own (without a host). A second dive went out into the sea grass area and saw several guitar sharks and 3 large turtles which were untroubled by our presence and gave good photographic opportunities." "Dugongs, Guitar Sharks and Giant Turtles are just a few of the amazing creatures you can see swarming the Sea Grass area in Abu-Dabab. " "Both sea grass beds and coral gardens were rich in large and small marine life. Huge turtles grazed the seagrass beds, while many octopus, cuttlefish and squid were found along the north shore in the coral gardens. Go very early in the day, the bay becomes a madhouse later when all the tour groups arrive. " "El Quadim Bay, El Quseir, should definitely not be missed on the (top 100 dives) list. It is an absolute treasure. " For people with partners or children who don't dive the Kahramana hotel is a good choice. This is a sprawl of small buildings, each one comprising two or four rooms (a room being a large bedroom, bathroom and hallway). There is plenty to do: horse and camel riding, beach volleyball, tennis courts, two swimming pools, two beaches and a children's playground. As you will not be near a town, paying a little extra for a hotel with three restaurants plus bars and bar-snacks is definitely worth it. They've managed to convert the desert into a garden with a huge array of gardeners keeping the plants healthy. Palm trees have been planted on the beaches and the buildings are the same red and ochre as the desert sand. "Oasis Dive Resort, Marsa Alam is a good place for divers, excellent dive shop, well organized shore diving all along the coast near Marsa Alam, house reef is OK, you can walk down to the pier and hop in to the Red Sea." "The Oasis Dive Center, at Oasis Dive Resort, offers both shore and boat diving (Elphinstone, Samadai Reef), free nitrox. Experienced divers can go on their own when shore diving or follow the group. Orientation to shore diving sites was excellent, with detailed hand drawn maps of each site showing landmarks and suggesting routes. Divemasters were all friendly, cheerful, and very experienced. Will go again and recommend to friends. Very Good. Good food, very professional dive shop and dive masters, very well organized, good equipment, free nitrox." We recommend these books for your trip to Marsa Alam. For �12.50 you get a guide-come-logbook for the Red Sea area around Marsa Alam, Egypt. The format is loose sheets designed to fit into a diving logbook binder. Includes Elphinstone. Read our review. Road map and good chart of all the major dive sites in Egypt, Jordan, Saudi Arabia, Sudan, Yemen, Eritrea and Djibouti.